Jenny Jen42: Happy 4th. of July! Happy 4th. Everyone! Hoping your day is full of fun and family and good friends! I'm heading off today to spend the day with my entire family! I'm quite excited about it. The past years have been spent on the West Coast in the Puget Sound with my father-in-law. Not a bad way to spend the 4th., but I have missed my family outings on the 4th. A day in Catonsville with crabs, the parade that consists of a ton of Boumi Temple floats, bands, little cars and Arabian knights! Then its back to more food off the grill and then the fireworks! My contribution is the pasta salad. 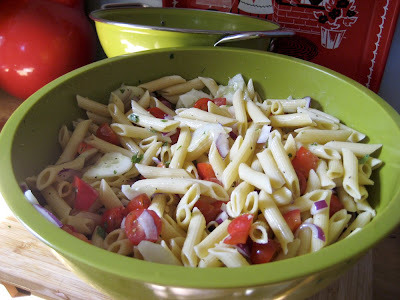 OK, I have to admit this...I've never made pasta salad..hence my morning project...I think I did a pretty good job ...penne pasta,cucumbers, red pepper, cherry tomatoes, red onion, fresh basil from my potted plant and some Newman's Italian dressing.